What is your driving force in volunteering with our agency? I enjoy doing office work, and really like working with Layne. Please briefly share an ‘aha moment’ (a moment of discovery or insight) that stood out to you during your time with HRI. There is always volunteer work to do, so I’m glad I get to help in the office. 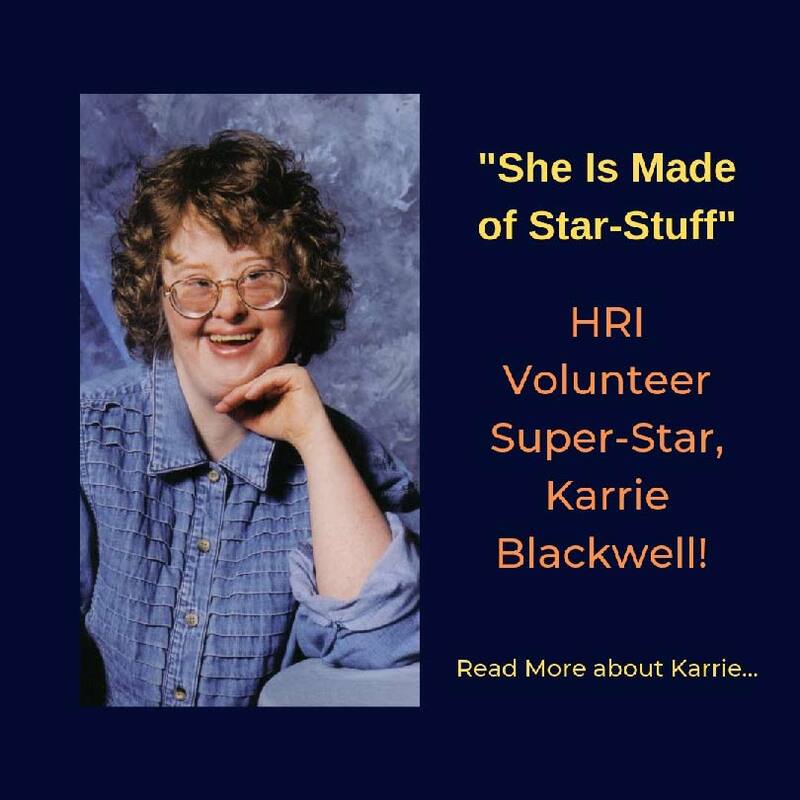 Anything else you would like to share about volunteering here at HRI? I like to see Layne. Other people should volunteer here, it’s great! HRI’s Youth Empowerment Program (YEP) Featured on HIP Giving! Latina immigrant, I was always told why was I wasting my time going to school? We submitted our Youth Empowerment Program as part of the #GoMujeres campaign by HIPGive in celebration of International Women’s Day. Once we our proposal was accepted, the campaign went live on Friday, 3/8/2019. We were overwhelmed by the love and support shown to us by our community as we raised 40% of our $5,000 goal in 3 days! WHAT IS YOUTH EMPOWERMENT PROGRAM (YEP)? We piloted our Youth Empowerment Program last year. The young Latinas served are all immigrants who have overcome abuse. They are courageous, resilient, and resourceful, and we want to help them and others like them to reach their full potential by growing and deepening the program this year. Please let us know if you want to learn more about this and the other great work of HRI. WHAT IS HIPGIVE? HIPGive is the first and only bilingual crowdfunding platform that champions on advancing Latino social impact projects and promoting philanthropy across the Americas. WHY GIVE TO YEP THROUGH HIPGIVE? Since April 2014, Latino-focused nonprofits have raised more than $2 million USD through 560 projects on HIPGive, reaching more than 200,000 web visitors, and a social media audience of more than 30,000 individuals, organizations, and businesses interested in social impact initiatives serving Latino communities. HIPGIVE also provides financial incentives to the fundraisers and donors in the form of contests, matching grants and other tools. WHAT’S THE YEP CAMPAIGN STATUS RIGHT NOW? By the publication time of this note, we have raised $2,005 of our $5,000 goal and we are 11 days away from closing of our campaign. Even a small gift makes a difference to this simple, but effective program. Help us meet our goal by donating today! Bill Holston, Executive Director of the Human Rights Initiative of North Texas, was honored by the Dallas Bar Association at the 27th Annual Martin Luther King Jr. Luncheon as the recipient of the 2019 Martin Luther King Jr. Justice Award. The award is presented to local leaders whose lives and practice exemplifies the principles embodied by Dr. King’s leadership. Former recipients include the late Hon. Barefoot Sanders, Mayor Ron Kirk, Kim Askew, Rhonda Hunter, E. Leon Carter, Dr. Walter Sutton, Jr., Dr. Michael J. Sorrell, Rev. Richie Butler, and Justice Carolyn Wright. Holston was already an active volunteer lawyer for HRI when he joined as Executive Director, in 2012, earning HRI’s Angel of Freedom Award in recognition of his commitment to provide excellent pro bono services to our clients. While the awards and citations Holston has received, in commendation of his superior experience and work in the field of law, are numerous, Holston’s true gift is his Heart that he brings to the face of our mission. HRI is proud to follow the leadership this amazing human being – Congratulations, Bill Holston. “Thank you Laura for that gracious introduction. And thank you to the Board of Directors and amazing staff of the Dallas Bar Association for this tremendous honor. And thank you to my friends, Board members of HRI, and our awesome staff. Also my wonderful supportive family, especially my beautiful esposa, Jill. It is particularly gratifying to me to be given an award named in honor of Dr. King. You see, I was born in Mobile, Al. in 1956, in the middle of the Montgomery Bus Boycott. Now Dr. King is an icon, but when and where I grew up and in my home, he was a pariah. When my mother saw me reading MLK’s Why we Can’t Wait, she said, “Why would you read that, he was a Communist.” And my mother was a teacher, and an educated person. I’m ashamed to say Dr. King’s death was not mourned by anyone I knew. To really put this in further context, I’d like us to recall an infamous year in the history of Dallas: 1963, We’re familiar with the assassination of the President that year, but the year began with a January 4 1963 visit by Dr. King to Dallas. He was here for a rally to raise money for poll tax payments for African American Voters. The Poll Tax was an instrument of voter suppression of people of color. Dr King was not warmly received by city leaders or the White press. His speech was protested by the members of the State’s Rights Party. There was a bomb threat. Just a few miles away was a monument to Confederate Generals, where it remains today, to our ongoing shame. Dr. King made the status quo uncomfortable as do all of the prophets among us calling for justice. There is usually a price for speaking truth to power. Dr. King paid with his life. Oscar Romero, the Salvadoran Archbishop, beatified this year by the Catholic Church paid with his life for his advocacy for disenfranchised people. For thirty years I’ve been inspired by the brave activists who faced torture and prison for standing up against the oppressor on behalf of the oppressed, who we have the privilege to represent at HRI. Activists still make us squirm. For instance two weeks ago, at a city event to lay a wreath for MLK, a group of Dallas Black Clergy (including my friends Michael Watters and Edwin Robinson. ) to challenge city leaders to move beyond lip-service in honoring Rev. Dr. Martin Luther King, Jr. And issued what they called a renewed call for Civil Rights in Dallas. • Police Review Board – “We are demanding complete and proper funding and resources for the civilian police review board as proposed by community organizations Mothers Against Police Brutality, Next Generation Action Network, the ACLU of Texas and Faith Forward Dallas. • Affordable Housing – “We demand that our city support the work of Bianca and Derek Avery and Faith in Texas through instituting form-based code as the zoning policy for the entire city..
• Livable Wage: An increase in minimum wage to maintain a living wage for workers. Speaking of making us uncomfortable, I’d like to make a few remarks about the present assault on immigrant rights. I have devoted the last 30 years to the cause of immigrant justice. I’ve been critical of every single administration during this time. I have become passionate about this, NOT because I feel sorry for immigrants. Instead it is. Because, even though the USCIS has removed Nation of Immigrants from its mission statement, we remain a nation of immigrants, and because I believe that immigrants offer their best to our country. As just one small example, there was the Ethiopian Asylum seeker I represented in Immigration Court, a torture survivor, who when I asked him why he continued his activism despite prison and torture replied through his tears, ‘because there is a price of freedom, a cost for democracy.’ Isn’t our country better with him in it? I think so. But that idea is under assault. One of my colleagues, an immigration advocate said, “These are historic times. These are times that define us.” And they are. Right now asylum seekers, torture survivors remain locked up in remote detention centers without access to counsel. Right now, asylum seekers are illegally turned away from our borders, forced to wait to enter the US to even apply for asylum. I invite you to read the stories of the assaults on transgender people waiting in line for the ability to even file a claim for asylum. Right now the acting Attorney General attacks the case law protecting women survivors of domestic violence, and imposes quotas on immigration judges Right Now Dreamers still lack a path to status. Right Now immigrant children are still being taken from their parents. Meanwhile, political leaders defame immigrants as well as their advocates. My brothers and sisters of the bar these things are unjust. And we have the ability to confront them. But I fear we lack the will to do so. I don’t say this to make you feel bad. I’m very proud of our bar and how much pro bono we do. I’m proud of the commitment of so many lawyers who change lives every day with pro bono services. I’m proud of the leaders of law firms that promote a pro bono culture. I’m proud of the award winning program of the Dallas Bar, headed by my friend Michelle Alden at DVAP, and all the lawyers who work in the trenches every day. I’m proud of my staff at Human Rights Initiative, changing lives every single day. But it’s not enough and still a fraction of lawyers who do the lion’s share of pro bono. And there are still firms in this city that do not truly support it. We know this, because: DVAP struggles to place cases We are for the first time struggling to place all of our cases with pro bono lawyers. But there is much to celebrate. It’s never easy to love your opponents, at least not for me, but we must. We are energized by youthful activists, but we also stand on the shoulders of those who went before us: People like the father of pro bono in our city: Judge Merrill Hartman and groundbreaking minority lawyers like Adelfa Callejo and the first awardee of this award Louis Bedford Jr, who became the 4th African American Member of the Dallas Bar. Mr. Bedford, who I was privileged to know and have cases with was a consummate professional. He, along with attorneys W. J. Durham and C. B. Bunkley, defended Wiley and Bishop College students arrested while participating in sit-ins. He also served along with Thurgood Marshall as legal counsel on a case to declare “separate but equal” unconstitutional in Dallas public schools. Louis Bedford became the first Black judge to serve in Dallas County, serving from 1966 to 1980 He provided legal services to activists from the SNVCC and SCLC, including my friends Rev Peter Johnson and Earnest McMillan, both of whom paid heavy prices including jail and beatings for their activism. It is important to recall that also it wasn’t until 1963, the Dallas Bar admitted its first African American member, Fred Finch, after refusing to do so in 1956. Justice work requires persistence and a non acceptance of the status quo. It is very hard work to challenge the status quo, but justice work, real justice work has always required agitation! People in need of justice need allies, and they need our voices. They need us to not be timid. In his letter from a Birmingham Jail Dr King addressed the clergy urging him to wait: “We will have to repent in this generation not merely for the vitriolic words and actions of the bad people but for the appalling silence of the good people. We must come to see that human progress never rolls in on wheels of inevitability. It comes through the tireless efforts and persistent work of men (and I would add WOMEN) willing to be coworkers with God, and without this hard work time itself becomes an ally of the forces of social stagnation.” And so we must be shaken from indifference, confronted with the facts of injustice. It requires the uncomfortable reminder of injustices. In 1789, The great British Abolitionist William Wilberforce in his first speech before Parliament to abolish the slave trade provided details of atrocities and then said: “You may choose to look the other way but you can never say again that you did not know.” It was another 18 years before this was accomplished. We all need to remember that activists throughout our history have persevered when things seemed dark and hopeless. Opponents of Nazi Occupation, lynchings of African Americans, Jim Crow, and criminal prosecution of homosexuals, all persisted in their activism when there seemed to be no hope. And sometimes they were required to labor for many years. And there are fights that are ongoing, Like the issues facing immigrants and our fellow transgender and non binary gendered fellow citizens. We are so proud of our Executive Director, Bill Holston! ﻿HUMAN RIGHTS INITIATIVE IS HIRING! 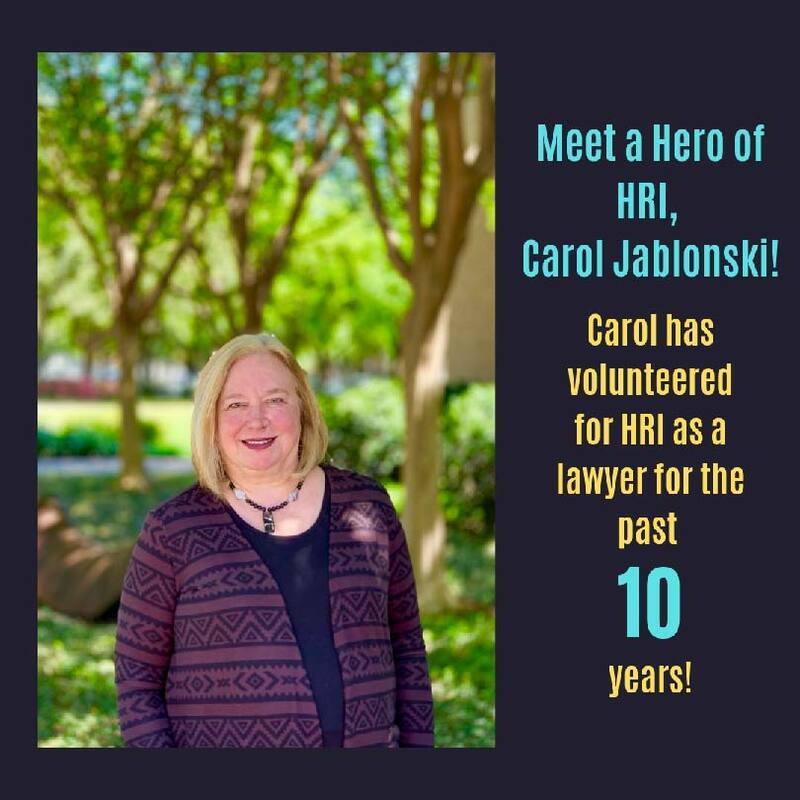 Organization Mission: Human Rights Initiative of North Texas (“HRI”) provides legal and support services to refugees and immigrants who have suffered human rights abuses, advocates for justice and promotes international human rights. 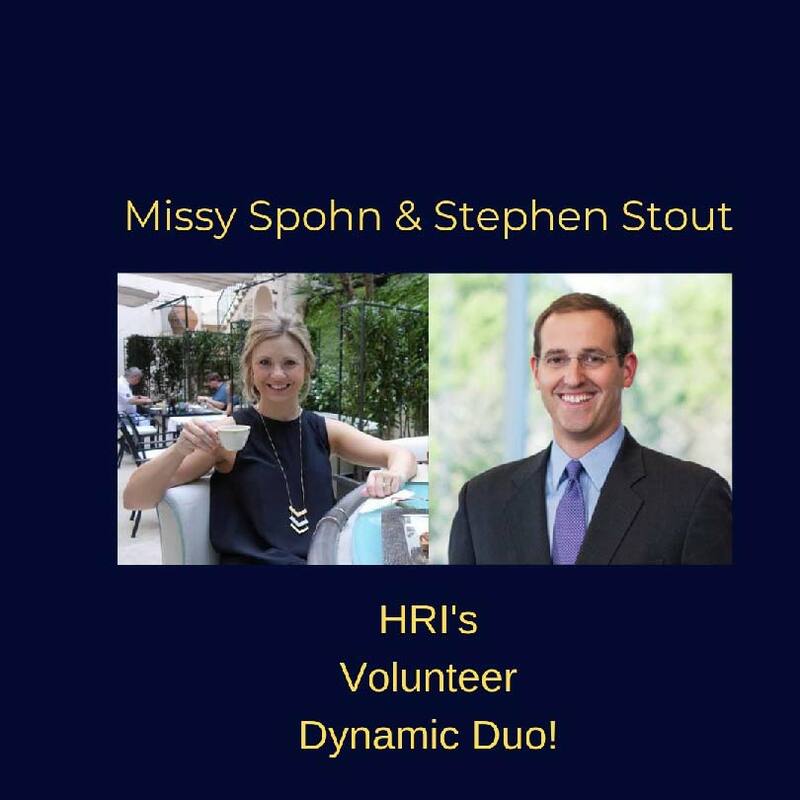 Position Description: Reporting to the Executive Director, the HRI Office Manager will be responsible for all bookkeeping, ordering of supplies, maintenance requests, and correspondence for the organization. The office manager will also assist in keeping the office organized and implementing and maintaining office systems as well as assist the Executive Director with scheduling. Vendor Management – manage current relationships (listed below) and potential new relationships. Demonstrated initiative and commitment to achieving results. Comfortable using technology, including Microsoft Office, and ability to quickly master new programs and/or software. Must successfully undergo background check upon hire and sign confidentiality agreement. Applicants meeting the above qualifications please email your cover letter and resume to Layne Faulkner, Volunteer & Communications Coordinator, at lfaulkner@hrionline.org. Applications will be reviewed on a rolling basis. No phone calls will be accepted. HRI will host a Volunteer Training on Feburary 20th, at our offices. For more information, please contact Layne Faulkner, Volunteer Coordinator. HRI is seeking full-time legal interns for our summer internship program to support Crime Victims Program, Asylum Program and Children’s Program. As our intern you will shadow attorneys who prepare applications for various forms of immigration relief, assist in conducting client interviews, draft and review supporting affidavits and other documents and perform legal research. You will have at least one legal writing project (memo or brief) that can be used as a writing sample. HRI’s prior interns rave about the in-depth, real world experience they receive. Through these internships, HRI strives to provide every legal intern with invaluable experience in immigration and nationality law and international human rights issues. For detailed breakdown of each internship, please visit HRI’s Internships and Fellows. Qualified applicants please submit your resume, writing samples, and a tailored cover letter specifying interest in particular program/project to Layne Faulkner, Volunteer Coordinator.